After a three-year absence, the UFC returns to Toronto. The big story of the match is Anthony Pettis missing his weight and being unable to compete for the interim featherweight title. A big blow for a card that already lost its original main event (Daniel Cormier vs. Anthony Johnson) due to injury. I am in press row and will give you the latest. In an aggressive first round, both fighters being with immediate kicks. Meek, making his fight debut is the early aggressor as both fighters exchange kicks. A devastating front kick by Canadian Mein scores. The pair exchange jabs, and Mein sideswipes a flying knee by Meek that would have surely ended the bout. No real rest holds. Mein seems hurt by grabbing his rib cage but gets back to his feet and scores with big left. Meek’s kicks seem to be giving the Canadian trouble. While Mein has the hometown advantage, Meek winning crowd over with the way that he manages to throw caution to the wind. Round one is even. There is no feeling out process as both fighters are swinging for the fences. Meek scores a big takedown to pin his opponent to the mat. Meek continuing to force the action. Mein’s strategy of countering doesn’t seem to be working. While Meek doesn’t seem to be landing much, in a decision, he clearly will get the points for pushing. Meek lands a triangle but Mein manages to break away. Not a good round for the Alberta native. Meek wins round 2, 10-9. FIGHT GOES TO DECISION. JUDGES GIVE UNANIMOUS VICTORY TO MEEK: 29-28. Fight looks like it will come down to this round. Gastelum seems revitalized. Pushes his opponent to the floor but Gastelum quickly looks to stand again. Gastelum landing strikes and jab effectively, almost at will. Kennedy looks like a broken man as it seems like it is just a question of when Gastelum will end it (and not if). Gastelum lands a pair of huge haymakers to finish. Kennedy down and Gastelum mounts to ground and pound him for the TKO. Gotta say, I thought Gastelum was finished after the first. Crowd is electric. Swanson again starts strong but Choi displaying no signs of relent. Choi seems to be favouring the jabs as Swanson starts to rely more on his legs. Shockingly Choi tries to put the fight on the mat (huh?) and this backfires as it takes Swanson almost no time to mount. Choi grabs Swanson’s leg and manages to get back into a standing position. Despite Swanson looking strong, Choi seems to have an answer. The warriors begin to trade and Swanson now is clearly landing more than his opponent. Swanson scores with a huge punch and Choi hits the mat. Is it over? Might have been had the bell not rung. Swanson wins round 3, 10-9. Cerrone predictably starts by throwing his feet. Cerrone’s kicks appear to be very effective early which is a bad sign for Brown. Brown holding on but just barely. Brown sizes up Cowboy but Cerrone quickly stops that with with a jab and strong striking. Brown is cut open. Brown throws a kick but slips but when Cerrone goes to mount, Brown manages to secure a triangle. Nothing damaging for Cerrone as he escapes. Easy round to call. Cerrone wins round 1, 10-8. Round 3. The fighters touch gloves and do a mini-embrace at the start of the round, after a war of words before the fight. Brown gets a takedown but Cerrone immediately returns to his feet. Cerrone then knocks Brown out with a head kick. Pettis falls early, but quickly gets back to his feet. Pettis is bleeding from the right eye. Holloway throwing punch after punch and seems to definitely be the favourite currently. Pettis goes to the clinch but can’t secure the takedown that he clearly wants. 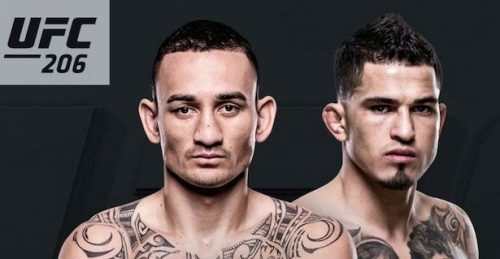 Another round to Holloway who appears well-positioned to secure the interim featherweight title. Holloway wins round 2, 10-9. Holloway lands a combination to start. Pettis tries a couple of front kicks. The fighters clinch. Holloway hits Pettis with a kick and immediately follows with punches to the head. Pettis covers up and the fight is stopped.